Article originally published in the North Island Gazette in 2007. H’Kusam or Xusam is believed to be a Kwak’wala word for “having fat or oil.” H’Kusam referred to both the Salmon River and the large First Nations village on its Southern bank. When the first Europeans explored the coast of Vancouver Island in 1792 they noted a large village site strategically located on the southern bank of what was to become known as the Salmon River. The village was on the border between the Kwakwaka’wakw and Coast Salish language groups, and is believed to have changed hands between these groups. 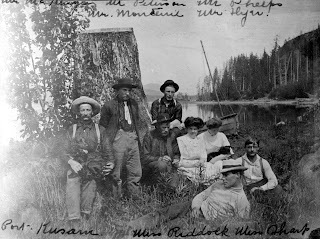 In 1894, after complaints from the white community about a disturbance being caused by the First Nations at H’Kusam, Indian Agent R.H. Pidcock arrived on the scene to find a large potlatch going on. Over 500 natives were estimated to have gathered for the event. The Agent tried to arrest the host, Chief Johnny Moon, but the white settlers were vastly outnumbered and eventually the Agent was forced to agree to take one of Moon’s sons instead, averting a potentially violent situation. 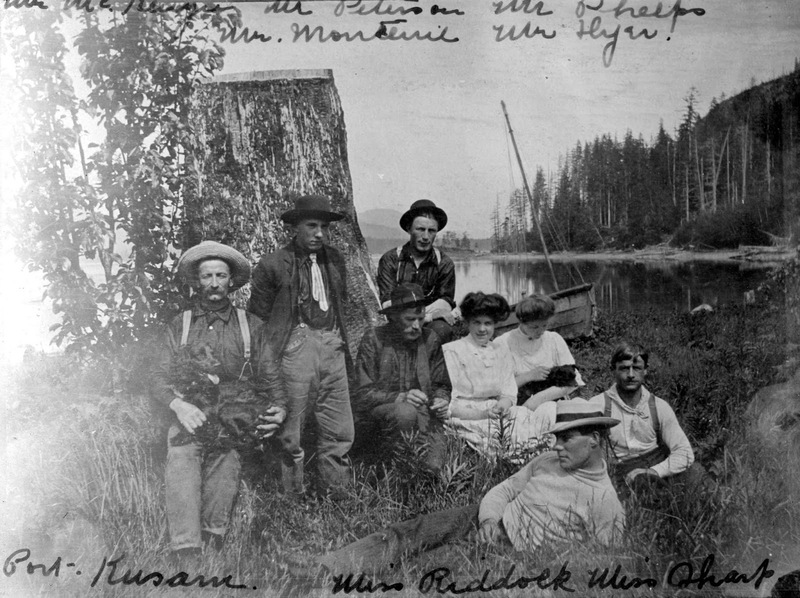 Theodore Peterson, a cook on sailing ships, settled near the mouth of the Salmon River in 1895. He married a local aboriginal woman and started a business partnership with Ed Wilson. “Port H’Kusam” soon boasted a store with a large false front, the H’Kusam Hotel, and a saloon. One of these buildings was also known as “Ruby House.” The community was a stop for coastal steamships in the early 1900s. 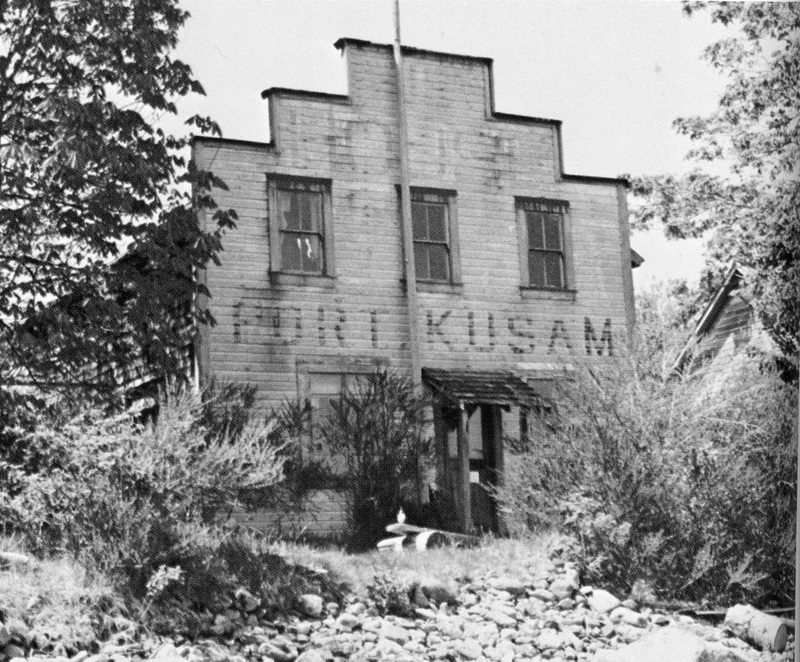 An official post office opened at Port Kusam on March 1, 1899. Otto Sacht was a 29 year old living in Victoria when a colleague suggested that they load up a ship with trade goods and head up the coast, selling the goods to local Indians and hand loggers. Sacht was interested, and the two set off in 1903/04. At their first stop, in H’Kusam, a local chief “Tyee Harry” was hosting a potlatch and purchased almost their entire load of goods for $4,500.00. The partners took their money and stayed to explore the area. Sacht fell in love with the area and stayed, becoming a founding father of Sayward. On December 1, 1911, the post office at H’Kusam was closed and it was moved to what was becoming a larger town at Sayward. A trail system now leads up the Mt. H’Kusam, behind the old village site. Called the H’Kusam Mountain Trails (or Bill’s Trails), it allows climbers to walk from sea level to 5681 ft, and provides a beautiful view of Johnstone Strait. An annual endurance climb has been held on the trail. A popular geocashing trail also leads through the old townsite. I really enjoyed going to Port H'Kusam in 2014. It made this article great as I could relate what I had seen to what you wrote. Thanks! Fascinating and truly a ghost town. I hiked there over 20 years ago. Great history for the Salmon River and Port H'Kusam!